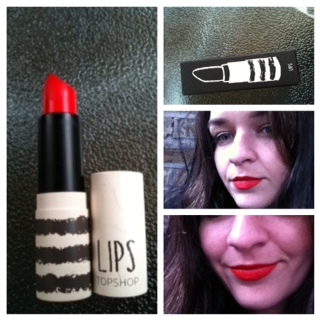 Topshop describe this gorgeous lip colour as a 'bright red'. I may well be imagining things because I would call it a ' feisty bright orange/coral/red shade of utter fabulousness'. Technicalities aside, the official name for this shade is Rio Rio and I'm a little bit in lust with it. This is a velvet, matte finish lipstick that feels creamy and hydrating on the lips thanks to skin loving ingredients such as shea butter and rice bran wax. Rio Rio is a perfect name for this lippy because this colour actually makes me feel like dancing at a carnival in very little clothing. If I do this, don't worry I won't blog about it. How do you feel about Topshop make up? I'm keen to try more from the range. I haven't tried any of the top shop lipsticks yet but I know if I do, this will be the first one I'll get! It's so gorgeous! That looks so good! I wish there was a Topshop in Montreal! I haven't tried the Topshop range because I am not big fan of the shop and their customer service. I have heard great reviews so might give into temptation and check out a few products when the bursary comes in! wow, this product looks wonderful.